David called to the Bar in 2018 as Faculty Scholar. Prior to calling, David spent 8 years in practice as a solicitor with litigation firm Levy & McRae, where he was a Senior Associate from January 2016. David had a broad practice including commercial disputes, criminal defence, evictions from commercial and residential property, fatal accident and public inquiries, firearms licensing, insolvency, property disputes, road traffic prosecutions and road transport licensing. David acted for insurer funded and private clients including members of the Federation of Small Businesses, Prison Officers’ Association Scotland and Scottish Police Federation. 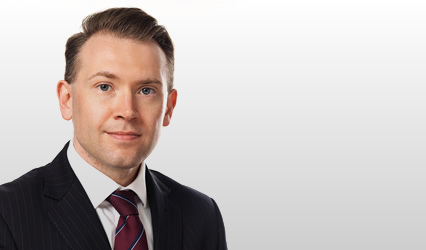 With this background, David brings with him an awareness that reputational issues, costs and the economic consequences of litigation are a key part of advising clients. David has appeared in Fatal Accident Inquiries, proofs and trials in Sheriff Courts throughout Scotland. He was also the instructing solicitor in numerous Court of Session and High Court matters. David has appeared before local authority licensing boards and the Traffic Commissioner for Scotland in several public inquiries relating to HGV and PSV operator licences as well as driver conduct hearings. David assisted in child contact and divorce matters in the Sheriff Court and as an instructing agent in the Court of Session. David has been a Council member of the Royal Faculty of Procurators in Glasgow since June 2016. Colin Donald Penrose  FAI 23 – Appearing on behalf of the POAS in a Fatal Accident Inquiry following the murder of a prisoner in HMP Barlinnie. Gwen Lowden v Chief Constable of Police Scotland 2014 S.L.T. (Sh Ct) 97; 2014 G.W.D. 20-381 – Instructing solicitor in successful action for damages for wrongful arrest on behalf of a police officer. Stuart James Rose & James Bell Fatal Accident Inquiry, January 2014 – Appearing on behalf of the POAS in a long running, conjoined Fatal Accident Inquiry.